My very safe and conservative trainer recently picked out an amazingly calm and talented 7-year old stallion for her to ride in the professional Hunter Derby’s and for me to ride novice level hunters. He acts like a gelding with impeccable ground manners, yet some people are telling me to always use a stud chain (he goes in a regular lead), never feed him from my hand (yet he takes cookies like a gentleman), never use a stall guard so he can hang his head out (he is very friendly and misses this), basically never trust him. Some of the Grand Prix jumpers in the barn are more unsafe to be around than he is. Am I supposed to treat him AS IF he is always going to be bad? If you treat a horse AS IF he is always going to be bad will this not eventually make him bad? His temperament is so kind and friendly this would be a nice trait to pass on to offspring, so I am reluctant to geld him unless he demonstrates he is not safe in a normal training barn environment. Am I doing the right thing? I don’t think it’s a matter of treating him badly, but rather, a safety and control issue. Proper use of a chain shank, over the nose, is not treating him badly, and will give you an added safety margin, should a situation present itself where you need way more control than a regular lead will give you. I have been in many situations with geldings where I wished I had more control. 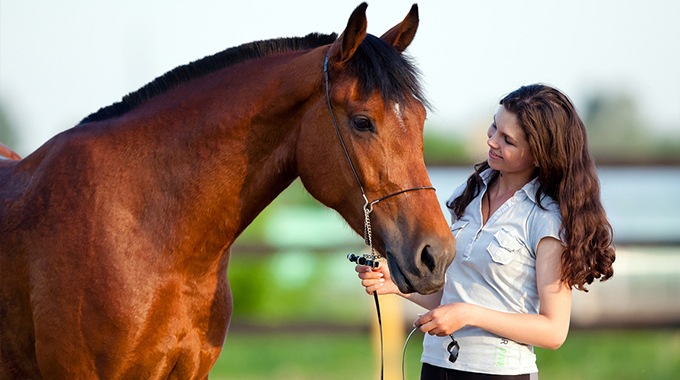 First day at horse shows can easily bring out unusual behavior in many normally quiet horses. Feeding him cookies from your hand would seem okay to me unless it starts to encourage some undesirable traits like nipping. Keep an eye on this. I agree on not using a stall guard for a stallion. It’s just not a safe enough barrier should he want out. If you want him to hang his head out, I would invest in a tall screen door and if he is okay hanging his head out, get one with a yoke. That is a much safer door. You don’t want him to get loose on the grounds and nether does anyone else. I agree with you and don’t think you should always treat him as if he were going to be bad. However, handling a stallion is a responsibility, and you must keep his respect. Don’t be afraid to apply the proper discipline when and if he needs it. 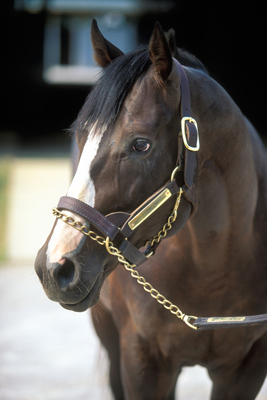 I would also advise calling a breeder and getting some additional advise on handling stallions. It sounds like you have an easy and fun project. Good Luck! 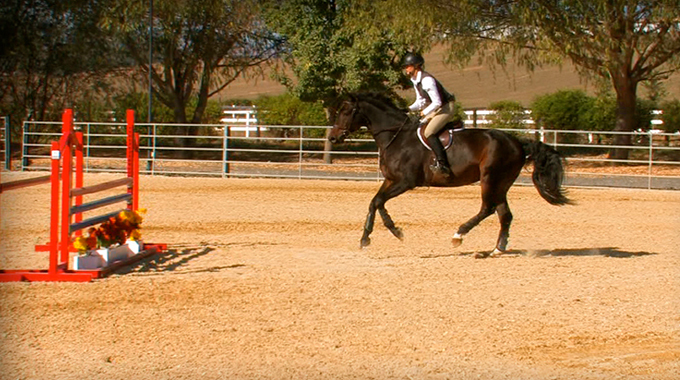 Bernie gives a member suggestions on how to help lengthen her horse's canter stride so she can get down lines in the correct amount of strides. 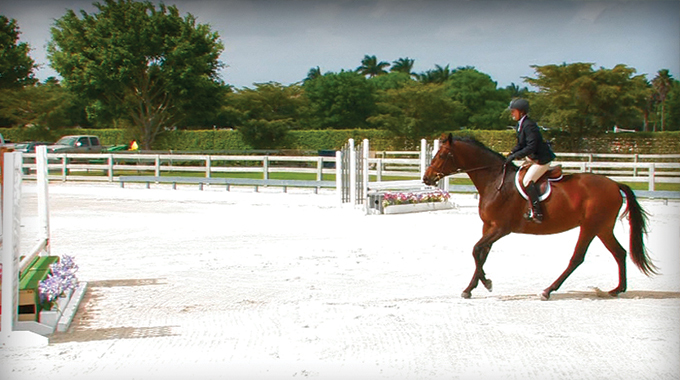 Verena Mahin offers a member suggestions on how she can develop her Holsteiner's topline. Rob Gage talks about finding and fixing your distance to arrive at the best takeoff spot.